50,000 words required to be written between November 1st and November 30th midnight. It will be great to finally get it out of my head and onto pages. An oxymoron. When we snoop on kids, we teach them it is permissible to snoop on others … to invade other people’s privacy and space … and then we wonder why they do not grow up with healthy, respectful boundaries for themselves and for others. If we truly want to prevent tragedy, foremost we need to teach children and teens about different RESPECT LEVELS … and the choices and consequences of all levels … so they can think, choose, and act with the RESPECT LEVEL they want to generate the results they want … empowering them to make good decisions no matter what challenges are presented to them and who is presenting the challenge. Connecting the Dots … If we do not want youth to go through our personal things, we have to show them the same Respect Level because how we treat them is how they will treat us, others, themselves and how they will let other people treat them. Connecting the Dots … If an eight-year old child was approached at school and told by a neighbour they were supposed to go home with the neighbour, a RESPECT-FILLED child would know they have the right to go the Principal’s office to check with her or his parent(s) and the Principal before leaving unannounced with someone. Connecting the Dots … If a fourteen-year old teen was approached on the street by someone in a car to go for a ride alone, a RESPECT-FILLED teen would know how to handle such an approach, inclusive of telling trusted adults. Connecting the Dots … If a sixteen year old boy was being tormented for his unusual attire and looks, a RESPECT-FILLED boy would be strong enough to withstand the teasing and would gather support to get the behavior be stopped before yet another life was taken by his or others’ hands. In order to teach kids how to connect the dots we have to see and do things differently too as we learn to connect the dots to generate the results we want to see. Though our Canadian healthcare system is more than what some people even have, like anything else, there is always room to grow and change to become more effective, efficient … and compassionate. Though I had not seen much of my Dad since my Mom and he separated and he moved on with his new life, I moved back to Kincardine in August of 2011, to help him with his transitions based on his developing healthcare needs. During the two plus years since I have been here, Dad has been forced out of his home by his wife who could not look after him because of her own challenges plus because his needs required more constant care and attention than just bringing in a support person for a few hours could do. Dad was moved into a retirement home in July and by the next April, after an incident and a brief hospital stay, was then moved to the second choice of two nursing/long-term care facilities and just seven months later, just a few days ago, was moved into our first choice nursing/long-term care home. Other than the changes in our Dad, what has astounded me the most are the efforts required, not to care of him as much as the duplication, triplication etc. required to convey information to so many different groups of people and not just to the three different places he has lived. Like most jobs I have done, my analytic, creative and helpful nature not only provides me with strong observational skills, but also the ability to often provide viable suggestions to help make things better … to fill in the cracks and gaps so what was in place, grows, like we need to, in order to keep meeting the changing needs and to make the lives impacted better. As a result, instead of writing an article or two about the gaps and cracks, I am taking on the challenge two healthcare professionals have pressed me to do … to continue with my advocacy, though rather than in scattered efforts, I have decided a comprehensive book would best reach, not just the healthcare system, but those who rely on it … because then we can get everyone connected and focused on where people, our loved ones, are not getting what they need and in some cases, are being disrespected and even being harmed. This is one of the two books I expect to be working on this winter. 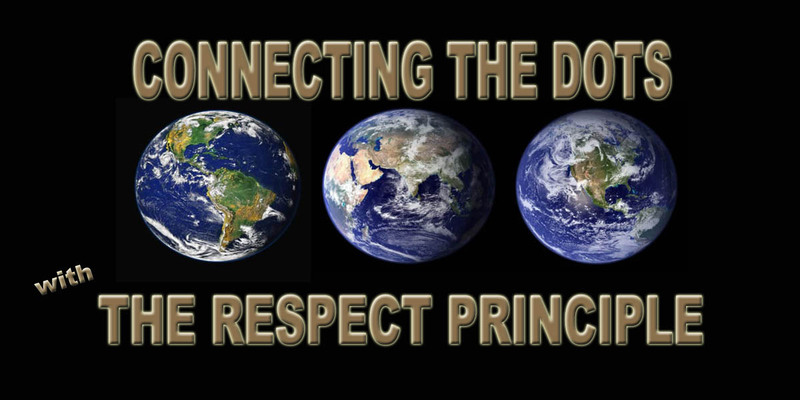 The other is the fiction, DARK HORSES, the complimentary behind-the-scenes story of why and how Connecting the Dots … with The RESPECT PRINCIPLE book and global initiative was developed. I will keep you posted on the book’s status, publication date and publisher. The moment the yardstick split in half over my head, something split inside of me. Picture an eight or nine-year old child, a girl, sitting in a Catholic school classroom, being taught by a black and white-robed woman, a nun, and then imagine the girl’s complete shock when the teacher, a nun, strode toward her ferociously, and to the girl’s amazement, did not rap her knuckles with the yardstick, but instead slashed the yard-long, thick ruler over her, my, head … literally snapping the yardstick into two pieces. Much of my childhood remains locked away somewhere in deep caverns in my mind, but there are moments like this persistence has discovered in my personal work. What was once, and still is at times, called disobedience and now often labelled distraction was neither when viewed with tools such as the psychological profile tool, the Myers Briggs Type Indicator or MBTI. My in-depth study of the MBTI, which is based on Carl Jung’s original work, revealed an important discovery for me: my personality type would have thrived in a Montessori learning environment, as opposed to the factory-learning environments of our public, and even of most private, school systems. Montessori learning environment is particularly ideal for “I” children who thrive on going off on their own to study what fascinates them though they are also taught the essentials, whereas “E” students thrive in group settings, both because of the way their brains work best. “E’s” the short form for “Extroverts” have brains that constantly seek external stimulus to feel engaged in the world, so they are attracted to, or create loud, bustling environments. They seek continuous stimulation from the outside world and the quiet of solitude is one of their least favourite pastimes. Give them a crowd, a team to work with, people to sell to and they are happy. Put them in a classroom where talk, talk, talk is the teaching method and they thrive because verbal communication is tops for them. Now, put an athletic, tomboy “I” girl child in an “E” environment also ruled by specific religious beliefs enforcing the wearing of dresses and skirts and demanded exacting group behaviour obedience on a child also being bullied for being “too different” and you have a recipe for disaster. Add to all of this, a religion, Catholicism, which made me feel even worse for my blatant disobedience to the expected conformity and additionally saddled me with guilt, embarrassment and shame for not only my disobedience but also just for my differences, you have the formula for creating a rebel … a wild child. In my mind, then and for a very, long time, I rejected God because I could not fathom why someone would create us, set us up to fail and then punish us. I could not understand why nuns would rap my knuckles with rulers, put me in the corner to humiliate me and with such a hateful look on her face, split a yardstick over my little head. With the other very unpleasant things happening in my life, some of them due to misunderstood and misapplied religious teachings and the rest from being a very different personality type in my community, the world to this very logical and analytical child made no sense … nor did God. Then darkness had me where it wanted me; caught me in the web of negativity, and even hate. I even grew to hate God and finally discarded the idea of him at all. But what I was not able to discard were the deeply rooted religious and societal teachings of unworthiness, which further life experiences reinforced, including being re-wounded by Christians when I much later visited other churches with a tiny flicker of hope they may be different in their approach, but with no success because they always made me feel like a sinner they themselves would “save” instead of just welcoming me, recognizing Jesus had already “saved” me if I chose to believe in him. We teach others how to treat us by how we treat ourselves, based on what I call the Respect Scale, and since I felt unworthy, I taught others to treat me the same way … always letting them put themselves before and above me … except during those times when a small outburst of rebellion would attempt to thwart their attempts, but they never lasted or I would move on, teaching someone else the same lesson … how to treat me as less worthy than them … and they did. As a teenager, I became fascinated with séances, ghosts and all things ghoulish. By my twenties and thirties, I considered psychics and other new age ideas, but then I started to run into new age writers who talked about God and I was not ready to consider God as a good thing because my experience still clung tenaciously to me. But, when my life hit its most darkest point, I demanded, “If you exist God, give me a purpose for living.” And he did, though for me, the journey back to really believing in God has been a long, arduous journey fraught with many setbacks, tests, and trials. In fact, it is only this year that I can honestly say I do believe, not just in a higher power, but in the God I once discarded through naivety and because of great pain and confusion. Like myself, many other people have had their faith beaten out of them. Others call what they believe in by other names and I certainly can understand and appreciate why they do so. Some do not believe in anything beyond this life and I say “to each their own beliefs” because having a specific belief forced upon you does not yield faith but division, fear, prejudice, hate, violence and as history also shows, war. All I can say to those who do not believe in God as I am now learning to by reading an amplified Bible, is that for the first time in my life I am discovering what it feels like to live in faith … to trust I am not alone … that someone has my best interests at heart .. and to be content, no matter what, because all the pain can and will be turned to good as a reward for believing in, not the God I was taught about incorrectly by teachings or experience, but by what I am learning and experiencing now. This time, my faith is my choice and no matter how others judge me and my faith, it is between God and me. I expect others to respect my belief as I respect their right to choose their own beliefs and if their beliefs do not seek to harm others … I am happy for them … and for us all … because I believe we are so much more than what we have come to believe and as a result, the opportunity is ours to create a better world than any generation has known. All Rights Reserved by DARK HORSES PRODUCTIONS/KAITLIN A. TREPANIER, Connecting the Dots … with The RESPECT PRINCIPLE Developer, Author, Speaker, Playwright, Altruistic Entrepreneur, and Human Rights Activist … because every child should know, by their own experience, they are valued … RESPECTED. The MBTI was created by the mother-daughter team of Myers and Briggs. The one we love the most we also give the most power to hurt us the most. We know this from all the stories and for some of us, from our own experience. This is the wee short version of mine. Late in my second marriage, my true self was trying desperately to shed its chameleon nature I had adapted to get the acceptance I never previously had in my life. Aiding my efforts were a year and a half of psychologist counseling, university studies with a psychology major focus and a lot of self-help reading to free years of internal and external oppression and suppression that allowed me to be the unhealthy creature, the chameleon, I had become. And then there was him. Though still married, almost twenty years by then, my husband would not budge. I asked nicely and then pushed fervently for us to make changes so I could stop being the chameleon he had always known, but of course, he did not want things to change because he liked what I had made myself into. Well, most of it. Or at least he was comfortable with who I had made myself be for him and my family. He stood back and watched with caution and trepidation, while a man I met at a souvenir company where I took a key account merchandising job after I had quit both my corporate job and university, watched with fascination. Instinctively I knew I was in trouble when I first saw him, but in my naivety, I had no clue the trouble he would bring into my life. Within months the marriage that was on its last legs long before we met at work was thrust into oblivion because I knew I could not longer live with someone who refused to let me grow and to adapt to those changes in me as I had adapted to the changes in him. Four months later, I moved out and a year later we were divorced. But, by then, my now ex-husband became involved with a friend of mine, whom he later married and kick started a whole new life of his own. But as for him, the gentle soul I loved so much, for his own non-conveyed reasons, turned on me when I clung too tenaciously. Severing our connection, pressured by a one-time friend of mine, he denied our connection and turned away. For years, I blamed the one-time friend who turned me into the hands of someone she knew I feared and over the years the list of people I blamed for betrayal grew over the years. Finally though, enough time went by and my Respect Level started to grow and I finally started to heal. Though the wounds from the betrayals were healing, they also created tough scar tissue that hardened my heart and prevented trust of the same kind to enter again. The hardness also prevented forgiveness from softening my heart for many years. It was only after years of wandering, somewhat aimless it seemed, adrift in a sea of unfamiliar faces and temporary jobs, where ports were visited but never stayed to avoid attachments of the deeper kind did I finally start to feel a pull which I thought was to settle down in one place, but which has turned out to mean my internal state needed to settle down … to finally forgive and to open my heart to love and trust again … starting with loving and trusting myself again … and others … and one day to love again so unconditionally as I first did him. I thought it was the list of many whom I thought had betrayed me, yet today I realized it was him I felt was the one who given me the “Judas Kiss” … but what I had not been able to acknowledge all these years till tonight is that I realize … it was me I needed to forgive for betraying my self … for not taking the best care of me … for becoming who I was not to get the approval I had hungered for all my life and for putting my life into the hands of people who did not have my best interests at heart, but their own, and into the hands of a man who had not committed to me, but for his own reasons, instead turned me over to those I most feared. A long sojourn these almost twenty years have been, but finally my chameleon nature is shed, I stand now comfortable in my own skin that I am still learning much about, and peace fills my heart because the forgiveness is complete. I forgive all for all have done their best in this world as it is. And as for him and me, now all the pain lies in the dust and what is left is the love. It has been said many, many, many times, that parenting is the most important job in the world. It has also been said that a nation’s leader holds the most important job. Emergency workers who put their lives on the line for us such as firemen, policemen and soldiers also do the most important jobs. Doctors and nurses who save lives are also top of the list. Examination of life on this world reminds us that it takes all of us, with our unique talents, strengths and abilities to keep the world running every day. Yes, we know there are problems. Yes, we know we don’t have all the answers. Yet, we can all stop to consider the idea everyone is valuable … worthy of RESPECT … for just being a life, so we can stop trying to measure our value over others by competing when such competition takes our energy away from just becoming the best unique individual we can be so we can share who we really are to help make the world a better place for us, our loved ones and everyone else’s loved ones to live in during our brief time on this planet we call earth … and home. There are lots of experiences in my life that I would rather not have experienced, including the current one I wrote about yesterday regarding Dad and I needing not only your prayers, but your financial help. With great emotional difficulty, including the swallowing of more of my pride built up to withstand the blows of judgment and rejection during my lifetime, I wrote the request for your help. In response, one person texted they had mailed a cheque, for which I am very grateful. Additionally though, God’s answer also included help for Dad’s other needs … his care needs. The several hours I spent with Dad on Sunday were exhaustive because of his ever-present intense drive to ride or walk, plus his frustration with his circumstances conveyed by his demands to come home. Then Thanksgiving Monday, I received a call regarding yet another fall and a request for me to come yet manage Dad again because the nursing home, as usual, did not have the staff to engage him one-on-one to keep him safe. My Dad’s wife and I arrived shortly after lunch and found him sleeping, but since we drove out there, as with other times, we woke him to take him for a visit during a country ride. Yet this time, when he arose from his bed, we discovered the two-inch pool of blood spotting his pillow, leaked from the same place on his skull he has banged open three times before, though this time he did not require an emergency room visit or staples or sutures. Tuesday morning, Pinecrest Manor called again, only this time to inform me the Owen Sound Geriatric Assessment Team was coming to meet with Dad, staff and me, so off to Pinecrest again Dad’s wife and I went. We joined Dad for lunch and then afterwards, for two hours I sat with a team member and a Pinecrest nurse to provide them with an extensive history of Dad’s life from being born in Tilbury, Ontario to the in-depth time Dad and I have spent together the past two and a quarter years. His second wife filled in some of the gaps too. Finally, finally, finally, even though I have not been able to convince the medical community to recognize the benefits to be reaped if he had a nurse visit every day to monitor his vitals, work with the dietitian and the home staff, so it could be determined if his “special needs” are a result of more than the effects of Alzheimers and Dementia, at least, his condition is going to be evaluated today by a team of external medical professionals, including a geriatric physician and two specialists from London, whom, I was told, in all probability will prescribe additional medication … to not “zombie” him out like he had been before, but just to help him rest enough so he stops injuring himself from falls experienced because he is over tired yet determinedly stays mobile putting not only himself, but other residents and staff at risk too. Finally, until I can afford to pay for someone to visit him every day to engage him personally, I will be freed from constantly having to be alert and available to drive out to Lucknow at the drop of a hat, as I have had to the past three days, to do my best to manage Dad for the Manor. Finally, I am relieved because I know I have done my best to ensure that what happened to him last Easter Sunday … being overmedicated that resulted in great harm to him and an unnecessary traumatic near-death experience … won’t happen again, so I can finally move forward myself. Now the questions to be answered are do I move to Lucknow to be within walking distance during the winter months … or elsewhere? Will he now live longer because the meds will slow him down? Am I freed to move wherever I want or am I still to be close for when his time finally comes? But then again, believing as I now do, with ever-growing stronger faith, I can trust where I need to be is where I will be and if I am the one to be with Dad during his passing, God will get me to Dad when I need to be with him … and if not, he will get the person who needs to be with him to him at his greatest time of need is what my growing Respect Level for myself … and as a result, for other people has done for me, along with my return to faith which has stopped me from feeling alone in this world and is teaching me also to lean on God first, who then uses the people best able to do what he wants done. Hmmm … imagine that … winning by playing … not sitting on the sidelines, playing it safe and comfy. It really is true that taking all the risks, quitting two jobs, going into debt, in order to get my Dad the best he needs, including the two close years we’ve shared … worth it, worth it, worth it … or at the ad says, “priceless” no matter the short-term discomfort for me. Much has been learned and experienced, so this morning, as with every morning now, I am grateful for everything.